This property is centrally located in the middle of N. Myrtle Beach and is close to Barefoot Landing, The Alabama Theater, The Outlet Malls and Hwy 22. Have breakfast at Dino's Pancake's and Ice Cream at Painter's (a local favorite of Vanna White's). toilet, shower, Master Bedroom has a Walk-in Shower. toilet, combination tub/shower, This hallway bathroom has a chair height toilet. Both bathrooms have been renovated with new cabinets, sinks, and Delta Faucets. New tile floors and granite counters. A/C unit and air handler were replaced in 2014. The washer and dryer are inside the condo for your comfort. Parking is Free for our guest. Living room overlooks the Beach & Ocean. New Sliding glass door to Oceanfront Balcony. Great view of Beach from the Living Room. Kitchen has Dishes and silverware service for 6 persons. The kitchen is fully stocked and well equipped for cooking in. We have a blender, coffee maker, and toaster. Plenty of cabinets (as many cabinets as found in larger 3 bedroom units). The condo has a table and chairs for four and the bar seats 4 also. This unit has two 40 inch Flat Screen TV's. This condo has a Chaise Lounge and 2 Chairs that overlooks the ocean. Direct oceanfront view. Deck with lounge chairs to sunbath by the beach. Additional chairs by the pool deck. A number of courses are close by, many within 5 to 10 minutes of the condo. Sit by the pool and relax or step out onto the beach for a walk or fun in the sun. 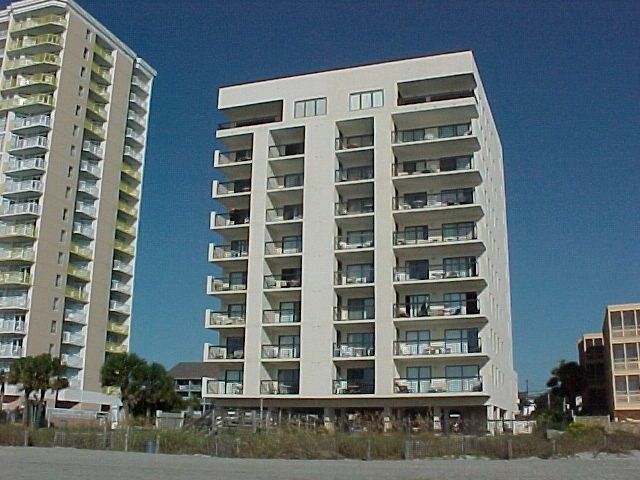 Beautiful condo - beautiful oceanfront view...owners are GREAT to work with! My husband and I just returned from our week's vacation stay at NMB in this beautiful condo. I cannot say enough good things about this place. Everything has been updated and it's just like having all of the comforts of home right at your fingertips (actually, this is much nicer than my own house!). The king size bed is very comfortable, as are all of the furnishings in the condo. Having two bathrooms instead of the typical one bath you find in most one bedroom places was one of my favorite things - both bathrooms are very nicely done, too. The balcony has an AMAZING oceanfront view and the seating is good - especially the lounger, great to relax in and watch the waves or read a book. Parking was easy, both under the complex and in the lots and the pool was well maintained and never crowded when we were there. The elevator is a plus, though the minimal stairs to this first floor condo are easy and convenient. The kitchen is well stocked for those who wish to cook while they are there and the two televisions - one in the bathroom and one in the bedroom - were both nice, up-to-date models. It's very obvious that the owners have taken the time to put nice furnishings in this condo. My only "issue" and suggestion would be to put full length (preferably light blocking) curtains in the bedroom as the hallway light is just too bright and the current window coverings are just too short to cut the light at night. I even hate to mention the curtain issue because I love this place so much, but it really is the only thing that needs addressed and then it truly would be PERFECT. This was our first time staying at this complex, first time in this unit and first time working with the owner(s). I could not have been more pleased with the experience and look forward to coming back in the future to this great vacation destination. Thank you again for providing us a great place to spend the week at NMB! We highly recommend this place to anyone looking for a great place to stay at the beach! We stayed for a week and had a wonderful time. The condo has all of the luxuries of home as well as a queen-size sleeper sofa and 2 full bathrooms that allowed four adults to comfortably share the space. We liked that the unit was on the first floor so that we could take the stairs and not have to wait on the elevator. The owner was easy to work with and always responded promptly to questions. The only complaint (hence the 4 stars) was the exterior light outside of the bedroom window. The blinds did not adequately block the light and for a light sleeper (as I am), I felt like I never got a good night's rest. Over all, we would consider renting this unit again. We stayed for 5 nights and loved the condo. Everything in the condo was super nice! The condo was a perfect spot---overlooking the beach! Everything in the condo was up-to-date. The location was perfect for us because it was quiet but close to everything! We particularly loved just being in the condo relaxing. It is a PERFFECT place for a get a way! We plan to use this condo again! We would HIGHLY recommend this place for couples!! Loved our time there. Great weekend get a way! We went for a long weekend and stayed at this condo. It was awesome to say the least! Great upgrades and perfect location overlooking the beach. We will definitely utilize this condo in the future; it is perfect for a couples get a way! Vickie, thank you for staying with us. I am glad you found the condo to be nice and updated, and we look forward to having you stay with us again on your next return to N. Myrtle Beach. Very well maintained and everything as promised. This unit has been updated and has everything you need for a couple to have a GREAT vacation week. Parking was never a problem. Beautiful ocean front private balcony. Well stocked kitchen, we cooked in 3 nights and had all tools necessary. Very convenient to Calabash, NC (our favorite place for Seafood), Main Street if you want the night life, and the solitude of your own balcony if you prefer the quiet nights. The washer and dryer is a great plus. WiFi sometimes a little weak.. but grab a book! Kristi & Joe, thank you for staying with us and I am glad you had a great time. I appreciate the comments on the condo. We strive to make sure everything is just right for our guest. We love going to Calabash also and eating at Ella's or the Seafood Hut. So much fun. Hope your summer is a good one and hurry back.